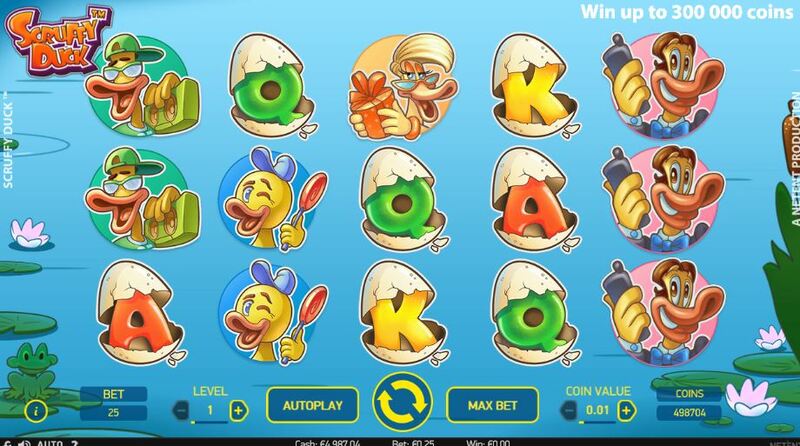 Scruffy Duck slot is yet another game featuring rather juvenile cartoon graphics that we have come to expect from Scandinavian developers. There are 25 lines featuring single card symbols and 4 different badly - portrayed cartoon ducks that are stacked up to 3 rows high. Fortunately they have limited any ridiculous 'quacking' sound effects to the minimum. The highest - paying symbols are naturally the ducks which offer a maximum of 16x stake for 5-of-a-kind down to the lowest card symbol at 1.6x stake. There are expanding Wilds on all reels though which for some reason turn into a not so scruffy white duck and are really the basis for any potential the game has. 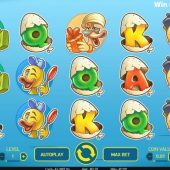 This is where at last Scruffy Duck becomes entertaining, as landing 3 Free Spin scatters which only appear on reels 3, 4 and 5 triggers a pick-me of 5 different bonus possibilities. You get a screen with 5 duck's backsides sticking out of the water and place your pointer on one. Perhaps this is Netent's ironic way of telling you graphically that the bonuses are as tight as the proverbial? 3. 10 spins with a Colossal Wild of either 2x2 or 3x3 appearing on reels 2, 3 and 4. During these the expanding usual Wild can only appear on reels 1 and 5. 5. 'Double Feature' which awards 6 spins where any 2 of the above randomly apply for each spin.